The Vampire bat looks sort of like a pig with fangs and large pointy ears. 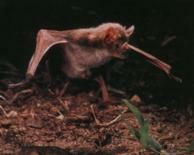 The Vampire bat is about 3 inches long and has a wingspan of about 8 inches. It weighs about 1 ounce. It has strong legs. The Vampire bat has a clawed thumb that comes out of the front edge of the wing. the front of its wings. It uses this for climbing around on its prey. The Vampire bat mates year round. The female usually gives birth, in April to May or October to November. The female only has one baby at a time. The gestation period is 205-214 days. When the pup is born its eyes are open. The mother nurses the pup for the first two months. The mother feeds the pup on blood, which she throws up after she drinks a good amount. At four months the pup leaves the nest to learn about foraging. The pup can take care of itself at nine to ten months. A vampire bat lives up to nine years but can survive up to nineteen years in captivity. The Vampire bat has two incisors. Incisors are two sharp and pointy teeth. It also has special saliva that runs down grooves in the tongue to stop the blood from clotting. The saliva has an anticoagulant in it called draculin. Unlike other bats the vampire bat can walk, run, and hop along the ground to stalk its prey. The vampire bat drinks the blood of birds and mammals. It lands beside the animal and will creep up to it. It then makes a little bite with its incisors and licks the blood. It shares the blood with other bats from its colony. They are not always successful in getting a meal. If the vampire bat doesn't eat for two days it will die. The vampire bat is a predator and prey. Its predators are eagles and hawks. Farmers are killing them because they carry rabies and other diseases, which affect both humans and cattle, but they're not endangered.